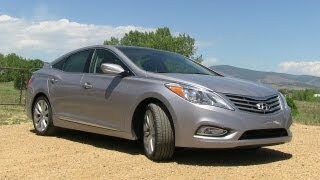 Hyundai Azera 2012 got introduced at the LA Auto Show 2011. Azera is the fifth vehicle to adopt the company’s signature Fluidic Sculpture design language. Tucson, Accent, Elantra, Sonata and Azera now all have a modern, sleek, sophisticated style, creating the illusion of constant motion. This flagship Fluidic Sculpture sedan also features a more powerful Lambda II 3.3-liter GDI engine, six-speed transmission, best-in-class combined fuel economy of 23 miles per gallon and a wide range of advanced safety equipment. LOS ANGELES, Nov. 16, 2011– Hyundai Motor America today introduced the all-new Azera in a North American debut at the Los Angeles Auto Show. Azera is the fifth vehicle to adopt the company’s signature Fluidic Sculpture design language.Tucson, Accent, Elantra, Sonata and Azera now all have a modern, sleek, sophisticated style, creating the illusion of constant motion. This flagship Fluidic Sculpture sedan also features a more powerful Lambda II 3.3-liter GDI engine, six-speed transmission, best-in-class combined fuel economy of 23 miles per gallon and a wide range of advanced safety equipment. Azera is the seventh vehicle in Hyundai’s 24/7 version 2.0 product initiative (seven new models in 24 months), on the heels of the all-newTucson, Sonata, Equus, Elantra, Accent and Veloster. The 2012 Azera represents a modern approach to the traditional large sedan segment by using an advanced powertrain, emotional design and luxury features offered with Hyundai’s strong value proposition. This approach has been successful for the other Fluidic Sculpture vehicles. Azera’s Fluidic Sculpture design takes inspiration from the mechanics of flight. The exterior of the all-new Azera is long, light and low. The unique, undulating beltline allows for a long, sleek roofline accented by the third window and wraparound LED taillights. A monoform side profile includes flowing lines. The face is masculine with a large powerful chrome grille and HID headlamps that integrate precise details. The stance is completed by available 19-inch multi-spoke wheels. The elegant look continues inside where Hyundai has created an upscale ambiance, thanks to a flow-through center fascia and instrument panel. These flowing surfaces complement the exterior design and wrap around the driver and passengers. The 2012 Azera offers luxurious appointments that rival the finest premium competitor brands. It offers a roomy cabin with more than 45 inches of legroom and 40 inches of headroom for front-seat passengers. Special attention has been paid to other interior details, such as an optional panoramic sunroof, which allows more natural light into the cabin and 3D Carbon interior accents. Ambient lighting compliments the vehicle’s modern appearance. Other unexpected luxury appointments include an electrochromic auto-dimming mirror with HomeLink® and power rear sunshade and manual rear side window shades. The side shades can be inconspicuously tucked away when not in use and no other car in the segment offers them. Seats are extremely important in this segment. 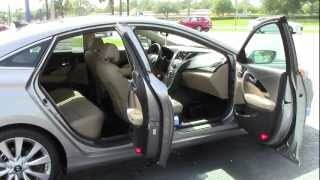 The 2012 Azera offers first class seating assignments for all passengers. Leather seating surfaces are standard. A ten-way power driver and eight-way front passenger’s seats are standard equipment. The driver’s seat has an optional cushion extension and an integrated memory system for the seat, steering wheel and side mirrors. Azera’s climate and seat temperature controls keep occupants in total comfort. There’s an old saying “there is no replacement for displacement.” Well, gasoline direct injection technology has changed the game. The Lambda II 3.3-liter GDI engine is the heart of the 2012 Azera. It produces a best-in-class specific output of 88.8 horsepower per liter, while having the smallest displacement V6 in the segment. This engine has a high-pressure direct injection system (over 2,200 psi), which dramatically increases power and torque, while reducing fuel consumption and emissions. This system eliminates the need for a large displacement V6 engine and increases the compression ratio from 10.4 to 11.5 for greater thermal efficiency and output. It also features all-aluminum construction, four valves per cylinder, piston cooling jets, roller timing chain, CrN Physical Vapor Deposition (PVD) coating on the top ring chamfer and Dual Continuously Variable Valve Timing (D-CVVT) for a broad power spread. A three-stage Variable Intake System (VIS) further broadens its power curve to improve the vehicle’s off-the-line acceleration and passing performance. EPA fuel economy estimates for the Azera are 20 mpg city / 29 mpg highway / 23 mpg combined. The engine is mated to Hyundai’s six-speed automatic transmission with SHIFTRONIC®manual control. This transmission offers smooth shifts and a wide ratio spread that ideally suits the engine’s characteristics. Azera’s powertrain also has an Active Eco mode, which modifies engine and transmission control for improved fuel economy that translates into more than a five percent improvement in real-world fuel economy. The Azera rides on a 112-inch wheelbase, with an overall length of 193.3 inches and width of 73.2 inches. 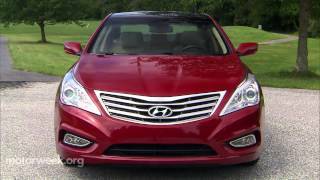 These exterior dimensions optimally size Azera between the Sonata and Genesis models. Azera has best-in-class front head and leg room. World-class weight efficiency is a program target for all Hyundai models. This strategy delivers outstanding fuel economy and performance simultaneously. At just 3,605 pounds, Azera is more than 200 pounds lighter than the Buick LaCrosse (3,835 pounds) and more than 400 pounds lighter than the Ford Taurus (4,015 pounds). This priority on weight efficiency allows the Azera to deliver a great combination of agility, performance and fuel efficiency. Standard are 245/45R18 tires on 18-inch Hyper silver alloy wheels. There is an optional 19-inch Hyper silver alloy wheel fitted with 245/40R19 tire. Azera has an exceptional level of standard safety features for the large car segment right down to the part people spend the most time in – the seats. Hyundai engineers have developed an impact-reducing seat system for the Azera. This seat system eliminates the need for active front head restraints and is expected to reduce head and neck injuries by 17 percent over the front seats in the previous generation Azera, which had active front head restraints. This result is achieved through optimization of seat back structure to further absorb impacts. Azera has a Vehicle Stability Management (VSM) system, which optimally manages ESC (Electronic Stability Control) and the Motor-Driven electric Power Steering (MDPS). VSM works to control two effects. The first is when a driver accelerates or brakes on a split-mu surface (slippery on one side, dry pavement on the other) and the vehicle wants to pull in one direction. VSM detects this condition and sends a signal to the MDPS to apply steering assist. VSM counters the pull and automatically provides eightNewtonmeters of counter- steering. VSM reacts the same way during sudden lane changes or fast cornering. Azera features nine airbags including dual front, front and rear seat-mounted side-impact, front and rear side curtain airbags and a driver’s knee airbag. Additionally, Azera offers impressive passive safety features including a Lower Anchors and Tethers for Children (LATCH) system for children’s seats and three-point seatbelts for all positions. Azera is available with two audio systems. Standard is a Dimension AM/FM/Satellite Radio/CD/MP3 audio system with seven-speakers and iPod®/USB/auxiliary input jacks. An Infinity 550-watt, Logic 7 audio system with 12 speakers, including an eight-inch subwoofer and external amplifier is available. An XM Satellite Radio interface is also integrated into the head unit and features channel logos and XM Data services, such as XM NavWeather®, XM Stock Ticker and XM Sports Ticker. Azera also offers standard HD Radio™ technology. A Bluetooth hands-free phone system with voice recognition, address book download and audio streaming is standard. 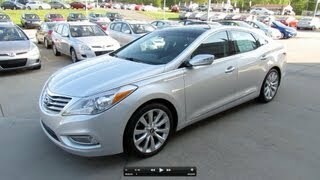 Hyundai Blue Link telematics is standard on the Azera with a 90-day complimentary trial period. Blue Link can be accessed from the buttons on the rearview mirror inside the Azera, the web and via a smart phone. Blue Link is offered in three packages: Assurance, Essentials and Guidance. Azera’s elegance is further brought to life through a bold color palette including Black Onyx Pearl, Porcelain White Pearl, Silver Frost Metallic, Smoke Gray Metallic, Hyper Silver Metallic, Venetian Red Pearl, Bronze Mist Metallic and Midnight Blue Pearl. Interior color choices are Camel, Graphite Black and Chestnut Brown.